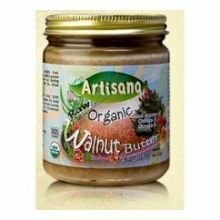 Artisana Organic Raw Walnut Butter, 8 Ounce -- 6 per case. Artisana Organic Raw Walnut Butter is a good source of Omega 3 fatty acids unsaturated fats and also a great way to add protein, essential vitamins and minerals into your diet. Feel invigorated as your body absorbs the raw, healthy energy unlocked from deep within the walnut kernels. Create a delicious dessert by mixing with apples, agave syrup and cinnamon. Try spreading on sliced bananas, fresh figs or add to smoothies. If you have any questions about this product by Artisana, contact us by completing and submitting the form below. If you are looking for a specif part number, please include it with your message.